Energize your day with the refreshing taste of new Uncle Matt’s premium grapefruit juice. A delicious blend of mellow USA grown Ruby Reds and robust Whites, our 100% pure Florida organic grapefruit juice is a great alternative to the morning juice glass, not to mention a nutritious pick-me-up that’s packed with health benefits all its own. Just like orange juice, grapefruit juice is full of vitamin C. It’s also a source of calcium, folic acid, phosphorus and potassium. What you might not know is that there’s a bounty of health benefits derived from grapefruit’s powerful phytonutrients –– like free radical-fighting lycopene and disease-deterring limonoids. 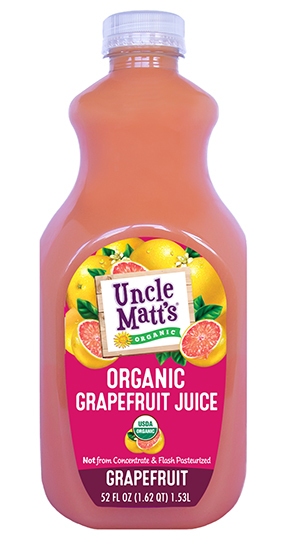 All of Uncle Matt’s flavorful and delicious grapefruit juice comes from its family of dedicated organic citrus growers. Available in 59 oz. size, the juice is not-from-concentrate, flash-pasteurized and USDA certified organic. Go ahead and taste for yourself why organic grapefruit juice has been Papaw’s favorite for decades.